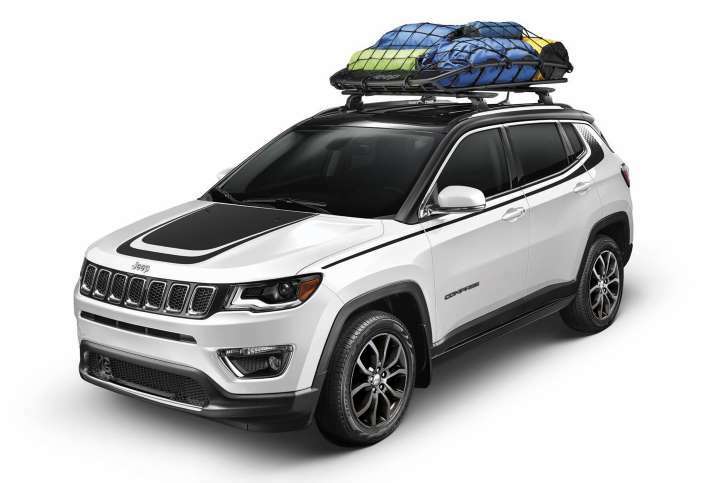 Buyers will be able to choose from more than 90 Mopar accessories on the 2017 Jeep Compass when it arrives in dealerships in the coming weeks. Today, Jeep detailed many of the parts and accessories it will offer on its new compact SUV. A full line of accessories will be available right at launch, the automaker says. Some of the accessories include molded splash guards, rooftop cargo baskets, steel rock rails, and roof racks for bikes and skis. Special packages offer black graphics for the hood and body side. To keep the interior nice and clean, Mopar offers specially badged door sill guards, all-weather floor mats, stainless steel pedals, cargo totes, and molded cargo trays that protect against dirt and sand. Prices on these accessories vary greatly. While a cargo tote may cost just $33.20, roof racks can set you back $225 and rock rails run $925. Adding black graphics to the Compass can cost between $100 and $180. The 2017 Jeep Compass is headed to dealerships in the first quarter of this year. Power comes from a 2.4-liter Tigershark engine producing 180 hp and 175 lb-ft of torque. Look for a host of available convenience features including a two-panel sunroof, adaptive cruise control, power liftgate, parallel and perpendicular parking assist, Apple CarPlay and Android Auto, Beats Audio, and a choice of 5.0-, 7.0-, or 8.4-inch Uconnect infotainment screens. Check out the gallery above for a closer look at some of the available Mopar accessories.